Great first post. 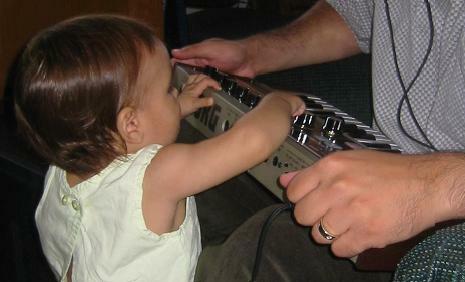 Here is my daughter at 11 months with a Korg MicroKorg. Also very cool. My daugter's actual favorite is a casio tonebank I've had since I was 12, with a demo that will play happy birthday over and over and over. It's on my list to be my first circuit bending project. Hopefully she won't mind too much. She seems to enjoy weird sounds most of the time. im thinking of getting a mcirokorg for my first synth. is it good? Yep. It's a fun little synth. The biggest drawback if you care are the small keys and only four voices of poliphony. The editing matrix is pretty easy to follow so it's a great first synth to explore sound creation on. The best thing about it is it's small and runs on batteries so it's a great travel synth. One tip - turn the effects of on it now and then to create new sounds. You'll hear more variety that way.